Here’s to the Next Generation! To re-edit the Enterprise finale into the existing TNG episode. DANLAV05, Phillip Austin, Matt Dale & Aidan Clark. They all know why. Beyond simply an extended edition, I wanted to retell the ENT footage so that it fit more firmly in place with the original episode. To that end, a conflicting scene from TNG has been removed along with the entire ending of the ENT episode. - New title cards after the opening credits, crediting the ENT cast and crew. - Sickbay scene removed from TNG episode. - End speech scene has been removed from ENT episode to match TNG episode continuity. - FX shots of the Enterprise have been mixed up to prevent immediate recognition of footage source. One wonders what was going through the minds of the producers of Star Trek: Enterprise when they decided upon the series finale for the show. Rather than give the show a proper send-off, they wrote a paraquel to a rather forgettable episode of Star Trek: The Next Generation, with the cast of Enterprise relegated to holodeck playthings of Commander Riker. It was a colossally dumb idea, and pretty much everyone involved with the production hated it. Out of this most rancid of lemons, Neuros has concocted lemonade as best he can. Mashing up the two episodes makes Riker's excursions into the holodeck almost sensical. The story actually flows better than I would have expected, given that over a decade of real time has passed between the two. Despite the misguidedness of the Enterprise production, the producers and writers did their homework, and there aren't any glaring continuity glitches between the productions. Indeed, Neuros has almost done the impossible -- he has breathed new life into the worst Enterprise episode, and making it if not welcome, at least a tolerable addition to the canon. 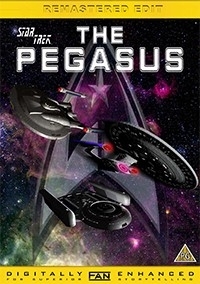 If one was to binge all of Star Trek (a formidable task), ending Enterprise with Terra Prime and watching Neuros' edit rather than the broadcast version of The Pegasus would not be a bad thing. The audio and video quality for the edit is perfect. The 720p presentation is nice and clear. However, Enterprise was filmed in 16:9 format, while TNG was 4:3. Neuros chose to crop Enterprise to 4:3, which is a sensible choice, but it does mean that you sometimes get people with their heads cut, and in one case where both people talking were at the edge of the 16:9 frame, and so you pretty much only see the set in between. A bit of pan&scan would have helped. A more dramatic attempt would be to crop both shows to 14:9, with care taken in every scene to have proper framing. I would recommend this edit for any fans of the Star Trek Universe, and in particular Enterprise fans who felt completely let down by the finale. Having the two shows integrated as well as Neuros has done redeems the damage that the producers did to Enterprise.